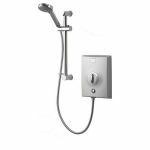 For the ultimate in convenience why not consider an electric shower? Heating only the water you require on demand, hot water is available to you in an instant. They can also be fitted anywhere without the need for a conventional boiler. We choose the models we offer you carefully and have a selection of top brands including Aqualisa, Triton and Ultra. These respected brands offer plenty of safety features and also easy installation options such as multiple water inlets and cable entry points.